Lynx packed 16 channels of their new mastering-grade A/D and D/A converter quality into a single 19" Thunderbolt interface for both Mac and PC systems with the Aurora(n) 16 TB! Usually ships 24 - 48 hours after order processed. Payments as low as $90/mo. Or, apply & pay as little as $90/mo. Lynx has announced the aurora(n) - a reimagining of their aurora converters, which have been one of THE most trusted converters in professional studios for the past decade. The new units feature upgraded A/D and D/A converters utilizing the same technology that led the Hilo to the front of the pack. With modular connectivity via Lynx's existing (and expanding) selection of L-Slot cards you don't have to worry about these units becoming obsolete like that old firewire interface you used 5 years ago. These new Aurora(n)'s come in 8, 16, 24 and 32 channel varieties and will be upgradable to add mic preamps, analog summing and additional digital I/O in the coming months. 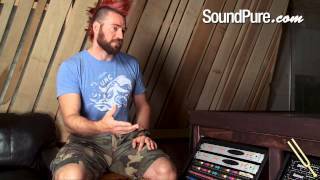 In this video, Sound Pure Pro Audio specialists Marc Kuzio and Chuck Giardino introduce the Lynx Aurora(n) Series of converters. This new generation of Aurora converters has blown us away with its level of detail, functionality, and ease of installation. It can also be used seamlessly with the previous generation of Lynx Auroras. The Lynx Aurora A/D Converters from Lynx Studio Technology are some of the world's best Analog to Digital Converters, renown for their incredible wide-open clarity, and stunning quality. In this video, the Aurora's advanced routing capabilities, in regards to the Analog and Digital Inputs/Outputs, are specifically highlighted by SoundPure's Pro Audio Expert Doug Wessling. 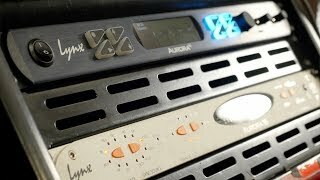 As Doug mentions in the video, each different studio setting, whether it be at home or in a professional environment, comes with it's own individual needs and limitations, but regardless of your setup, the Lynx Aurora Converters provide universal flexibility to work with whatever system you have running. The Lynx Aurora Converters come in 8 channel or 16 channel versions, offering stellar audio quality with 192 KHz, 24-bit mastering quality A/D and D/A conversion, that far exceed the quality of the competing converters in it's price range, as well as most more expensive conversion systems. Acclaimed for it's accuracy, detail and transparency, the Lynx Aurora A/D Converter can truly be used in any setup, including on-location recordings. Just about every session we have done here at SoundPure, has been through the fantastic Lynx Aurora Converters. Call us today to talk to an expert about how these outstanding converters can work for you, or if you have any questions about their capabilities, we are ready to help! 919-682.5552. or 888.528.9703. The Aurora(n) converters represent the culmination of years of research and development dedicated to significantly improving upon the well-regarded Lynx Aurora 8 and 16 models used by professionals around the world. For the first time Lynx introduces a 24 and a 32 channel model along with all new 8 and 16 channel models. Aurora(n) significantly improves upon the spectacular performance and specifications the world has come to expect from the well-regarded Lynx Aurora line – each in a single rack-space. Providing an even greater level of wide-open, uncompressed and unequalized audio for studios, mastering facilities, remote recording, broadcast, live performance and production installations, these Aurora(n) converters set a new standard in analog to digital and digital to analog conversion. Leveraging technology that was previously reserved for the Lynx Hilo combined with the latest FPGA processors, the Aurora(n) achieves the pinnacle of transparency and low distortion and noise. The Aurora’s future-proof design is expanded in the Aurora(n). New enhancements and capabilities will be made available through firmware upgrades. LSlot expansion slots allow for a wide array of current connectivity options to include Thunderbolt, Dante, ProTools|HD, USB and future formats. Expandable audio I/O modules are being developed to include pre amp, analog summing, digital I/O (AES3 + ADAT) which will be available in 2017. This makes for an Aurora(n) that will perform exceptionally for you now and remain innovative well into the future. Also added to the line are two audiophile-grade headphone outs with independent volume control. A 480 X 128 TFT LCD display provides immediate access to all levels and functions – also configurable for future functionality. 3rd Power CEO Jamie Scott mimicking classic record tones achievable with the Dreamweaver and 2x12 cabinet. 3rd Power CE Jamie Scott demonstrates the versatility of the British Dream's ability to overdrive based upon input volume, and plays some killer classic rock guitar riffs. Our own Chris Boerner gettin jazzy with the Eastman 905ce. Chris Boerner jazzez it up with the Buscarino Monarch custom guitar. This is the guitar played acoustically and mic'd with a stereo spaced pair of Peluso P67's. Tom Ribbecke Halfling archtop guitar playing "Stella By Starlight" into AER Alpha amp(all controls 12 o'clock) mic'd with Peluso 22 251 into A Designs Pacifica feeding Lynx Aurora 8. Tom Ribbecke Halfling archtop guitar played into AER Alpha amp(all controls 12 o'clock) mic'd with Peluso 22 251 into A Designs Pacifica feeding Lynx Aurora 8. Jimmy Foster Basin Street 7 String Cremona Burst guitar played into AER Alpha amp(all controls 12 o'clock) mic'd with Peluso 22 251 into A Designs Pacifica feeding Lynx Aurora 8. Benedetto Bravo electric guitar played into AER Compact 60 mic'd with Peluso TR 14 into A Designs MP-2A feeding Lynx Aurora 8. McNaught Vintage Single Cut electric guitar (bridge pickup) played into Rivera Chubster 40 Combo(channel 2, volume 5, bass 5 mid 6, treble 7, master 5, presence 10, boosted) mic'd with AEA R84 into LaChapell Audio 583s Tube Preamp & mic'd with Sennheiser MD 421 II into A Designs Blue Preamp feeding Lynx Aurora 8. McNaught Vintage Single Cut electric guitar (neck pickup) played into Rivera Chubster 40 Combo(channel 2, volume 5, bass 5 mid 6, treble 7, master 5, presence 10) mic'd with AEA R84 into LaChapell Audio 583s Tube Preamp & mic'd with Sennheiser MD 421 II into A Designs Blue Preamp feeding Lynx Aurora 8. McNaught Vintage Single Cut electric guitar (bridge pickup) played into Rivera Chubster 40 Combo(channel 2, volume 5, bass 5 mid 6, treble 7, master 5, presence 10) mic'd with AEA R84 into LaChapell Audio 583s Tube Preamp & mic'd with Sennheiser MD 421 II into A Designs Blue Preamp feeding Lynx Aurora 8. McNaught Vintage Single Cut electric guitar (neck pickup) played into Rivera Chubster 40 Combo(channel 1, volume 8, bass 3 mid 7, treble 5, master 5, presence 8) mic'd with AEA R84 into LaChapell Audio 583s Tube Preamp & mic'd with Sennheiser MD 421 II into A Designs Blue Preamp feeding Lynx Aurora 8. James Tyler Studio Elite Burning Water electric guitar (position 1 pickup) played into Rivera Quiana amp(channel 1, volume 7, bass 4 mid 7 treble 5, master 5) mic'd with Sennheiser MD 421 II (close) into A Designs Silver Preamp feeding Lynx Aurora 8. James Tyler Studio Elite Burning Water electric guitar (position 5 pickup) played into Rivera Quiana amp(channel 1, volume 7, bass 4 mid 7 treble 5, master 5) mic'd with Sennheiser MD 421 II (close) into A Designs Silver Preamp feeding Lynx Aurora 8. James Tyler Studio Elite Burning Water electric guitar (position 1 pickup) played into Rivera Quiana amp(channel 2, volume 5, bass 7 mid 6 treble 7, master 6, reverb 3, presence 10, focus 10, boost on, bright on) mic'd with AEA R84(8 inches off) into A Designs Blue Preamp & Sennheiser MD 421 II(close) into A Designs Silver Preamp feeding Lynx Aurora 8. James Tyler Studio Elite Burning Water electric guitar (position 5 pickup) played into Rivera Quiana amp(channel 1, volume 7, bass 4 mid 7 treble 5, master 5, boost on) mic'd with AEA R84(8 inches off) into A Designs Blue Preamp & Sennheiser MD 421 II(close) into A Designs Silver Preamp feeding Lynx Aurora 8.
jamblues electric guitar position 4 pickup.